and not being able to find it? Are you finally ready for true love and happiness? and lasting change in your life? The right person is out there looking for you, right this second. Yet you will never meet them if you keep doing things the same way. Sometimes we need to try something NEW to get a different result. Chances are, if you haven’t found “the one”, it’s time for you to try something different too. 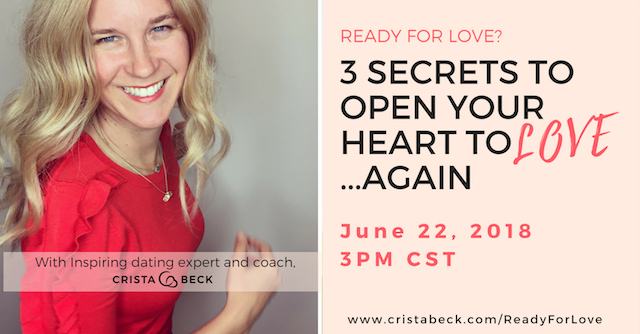 That’s why in this online one-hour mini-workshop, I am going to share with you my 3 best secrets for helping my clients remove the blocks that are holding them back from easily attracting the partner of their dreams. It’s worked for them, and knowing these 3 secrets will speed up your success in finding love too. Sometimes, no matter what you do to take a step forward in finding love, something within yourself still holds you back. It’s normal to encounter fears, doubts, and limiting beliefs when you start dating and putting yourself out there. Our past romantic relationships affect our current reality and can actually prevent us from attracting LOVE! Accumulated relationship residue. Emotional baggage. Unprocessed emotions. They can all unconsciously block love from showing up and compromise your happiness and sense of freedom. Happily, once you bring this relationship residue out of hiding and into the light of your awareness, it’s absolutely possible to release it! 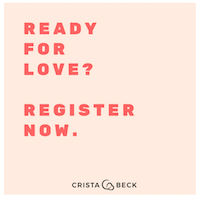 In this ONLINE workshop, I will support you in letting go of what’s been holding you back so you can open yourself to LOVE again. You see, every day, every minute, every SECOND that goes by is another minute you are not spending with the love of your life. Especially when you KNOW that this person is out there, waiting and hoping for YOU as well. Won’t you let me help you? The key to finding this person is right here in front of you. When I have done this event in the past it has sold out… so take action now. To register and secure your spot go here. I want you to experience love and happiness in their fullest forms. You deserve to love and to be loved. Come on out and share with a single friend! I look forward to shifting your world! Let’s get you some lovin’. Register here for this online event.